Fusarium ear rot is the most common ear disease, caused by several fungi in the genus Fusarium. Symptoms are a white to pink or salmon-colored, cottony mold that occurs on single or multiple kernels scattered or clustered on the ear. 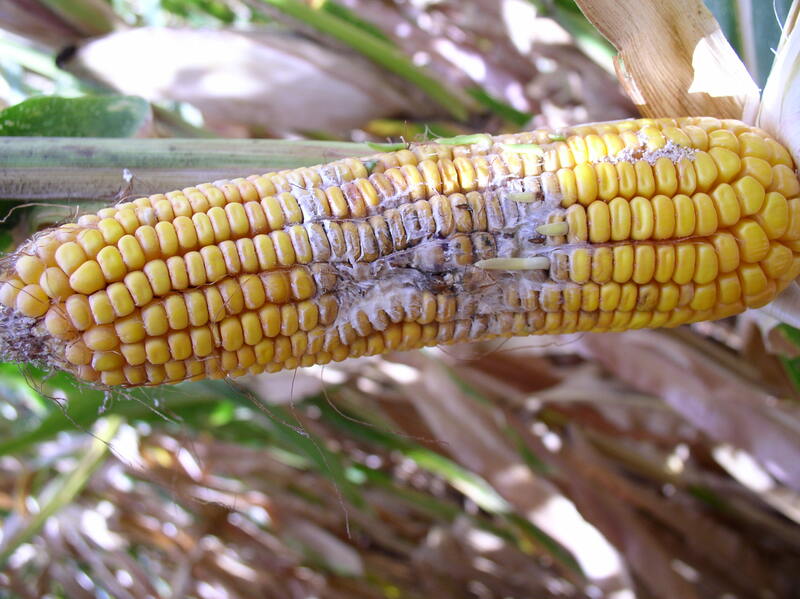 Decay often begins with insect-damaged kernels. 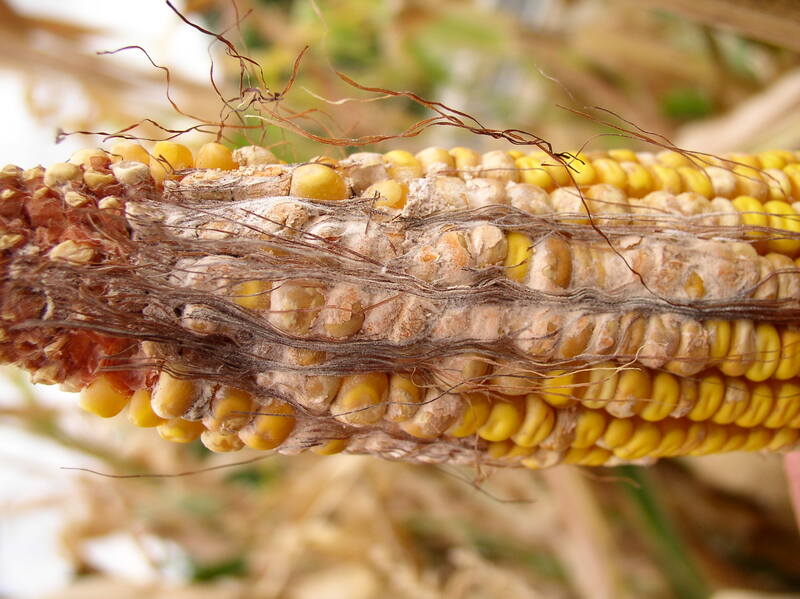 Infected kernels are frequently tan or brown or have white streaks. Causal fungi overwinter in corn residue and on dead, grassy weeds. Fusarium spores are spread by wind and splashing rain to silks. Infections also occur through wounds made by insects or other types of wounds in kernels. Insects also act as vectors of Fusarium. F. verticillioides can grow throughout the corn plant, and some ear infections may result from the fungus entering the ear through the stalk. Disease is favored by hot and dry weather during and after silking. 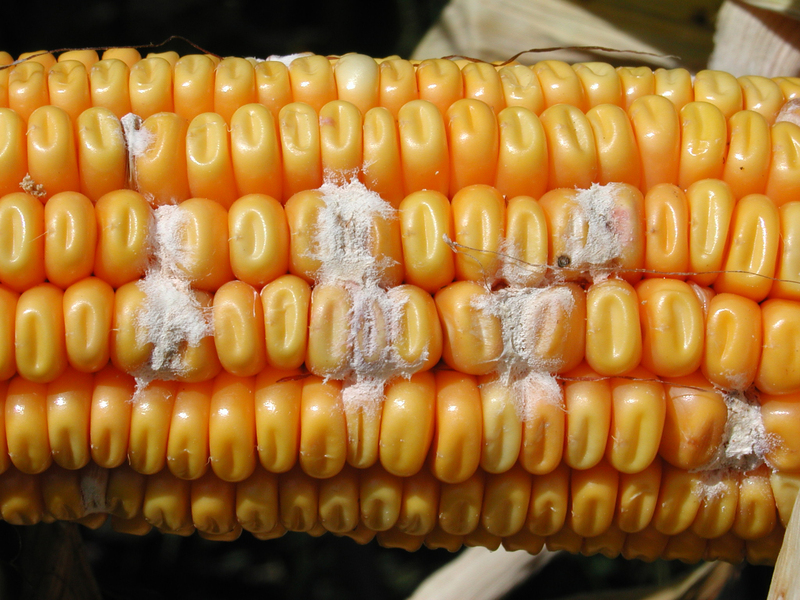 Several Fusarium species causing ear rot also can produce harmful mycotoxins, so caution should be used when feeding moldy corn to animals. 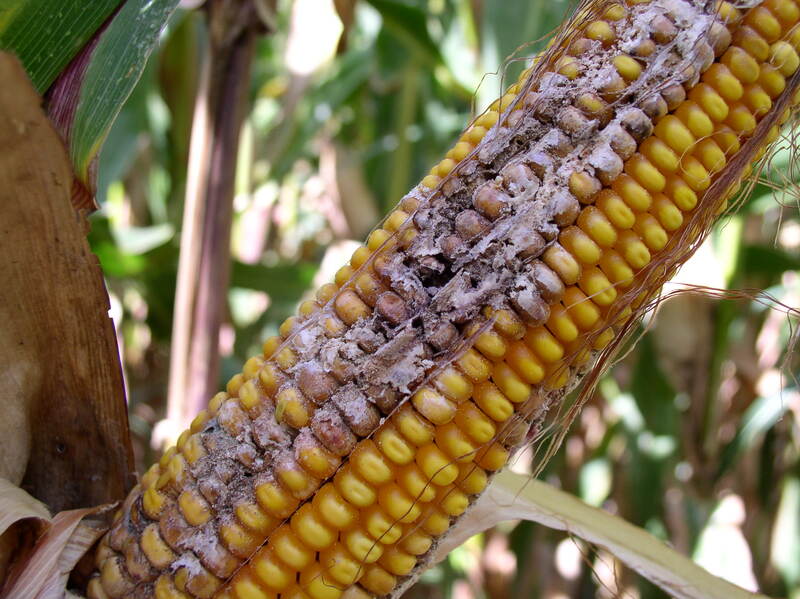 Moldy corn should be tested for mycotoxin contamination prior to feeding. 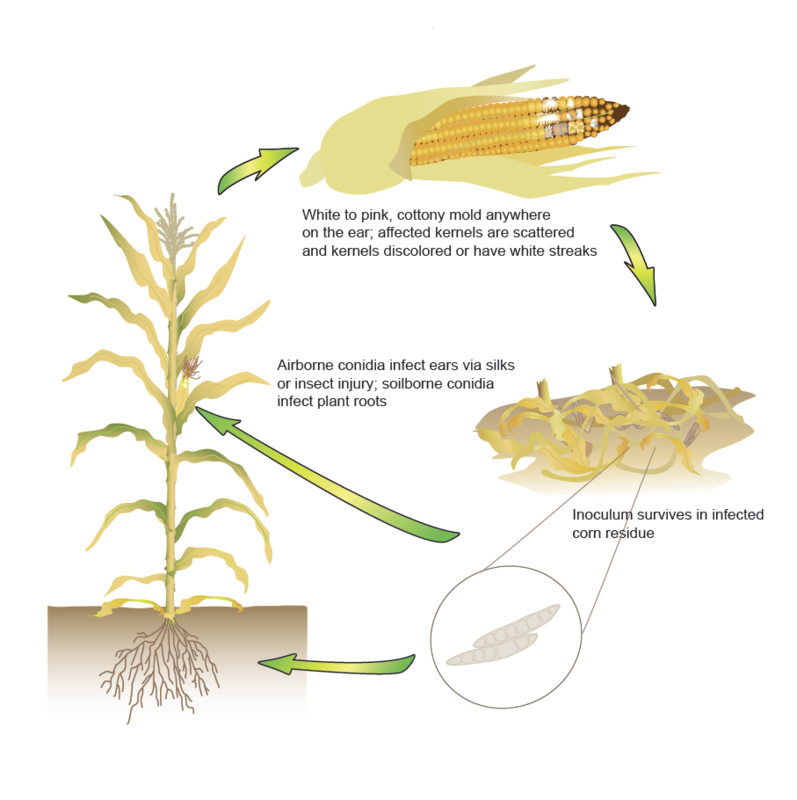 Fusarium ear rot disease cycle. 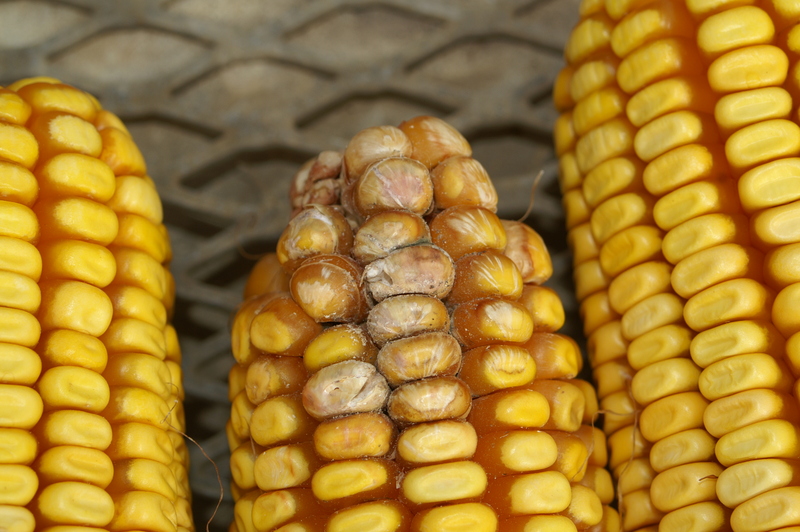 Fusarium ear rot often begins with insect-damaged kernels. White to pink or salmon-colored, cottony mold indicative of Fusarium ear rot. Scattered signs of Fusarium ear rot on kernels. 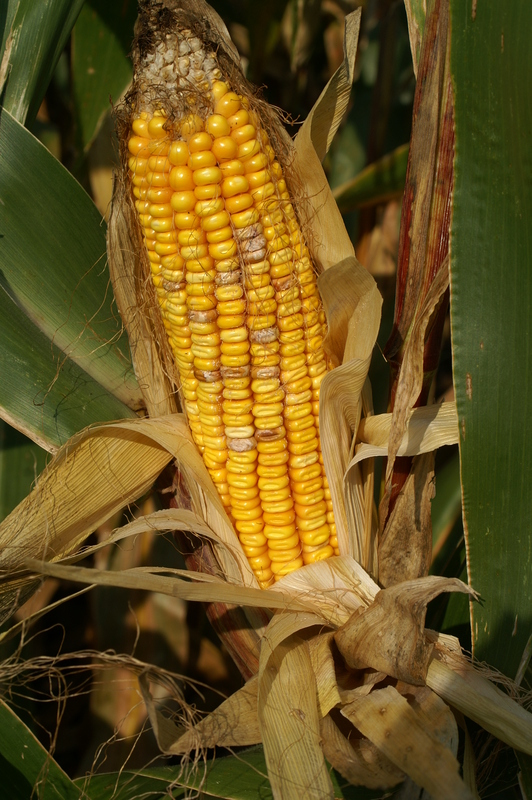 Scattered kernels with symptoms and signs of Fusarium ear rot. Starburst pattern on kernels indicative of Fusarium ear rot.